So begins Director’s Order #100, “Resource Stewardship for the 21st Century,” issued by then-NPS director Jonathan Jarvis at the end of the National Park Service’s centennial year. The order officially enshrines changes in conservation and resource management in national parks that have been brewing for decades. Since the 1980s, it has become increasingly clear that maintaining parks as “vignettes of primitive America”—long an imperative for the NPS—was an impossible task. Climate change, pollution, invasive species, and the like have been changing parks and the world around them in ways beyond the control of park managers—primitive America is gone and is not coming back. Moreover, “NPS will emphasize resilience, connectivity . . . and life-cycle stewardship as guiding strategies for resource management.” In other words, we will manage so that we help natural and cultural resources—like plants, animals, water, artifacts, historic structures, and cultural landscapes—persist and adapt to changing conditions. This does not alter the National Park Service mission to preserve unimpaired natural and cultural resources and values for the enjoyment, education, and inspiration of this and future generations. But our policies now recognize that complex forces are affecting park resources in ways that are impossible for one agency to control and with consequences that are sometimes irreversible. Species, historic structures, and other resources may be lost from parks—some already have—but our job is to keep the ecosystems and cultural resources as healthy possible as these changes happen. This is a big change for the National Park Service. In many ways, the health of parks is analogous to human health. We regularly monitor park “vital signs”—like nitrogen and mercury levels in the air and precipitation, tree regeneration and growth, pH levels and water clarity in freshwater ponds and streams, and scores of other indicators—and the condition of historical structures, archeological sites, and cultural landscapes. We try to find the source of more acute problems to fix or improve them, like a local pollution source, an obstructed waterway, or an eroding trail. This reduces stress and improves the health of park resources so they can better bounce back from unavoidable and unpredictable big disturbances (think hurricanes and floods) and also handle the more chronic problems (think climate change and air pollution) that will take a very long time to solve, and that parks will have to live with for the foreseeable future. With the help of Friends of Acadia, we at Acadia National Park are ahead of the curve and already well on our way to implementing this new approach to stewarding resources. Wild Acadia began as an initiative three years ago, and the strategy and goals we laid out then are exactly in line with the new NPS policy. We have already learned and achieved a lot at our pilot area at Cromwell Brook Watershed, which starts around Dorr Mountain, the Tarn, and Sieur de Monts, then drains alongside Great Meadow Drive, past the Bar Harbor athletic fields, under Main Street, and into Cromwell Cove. Upper reaches of the watershed are in Acadia National Park, while the lower reaches flow through private property and land belonging to the Town of Bar Harbor. We are working with dozens of partners to preserve and restore the ecological, historical, and cultural integrity of the watershed. You can read about the rationale and early evolution of the Wild Acadia concept in the summer 2013 and fall 2014 issues of the Friends of Acadia Journal. Here we present three examples to give you an idea of our approach, our successes thus far, and the challenges that lie ahead. Tour buses traveling the Loop Road routinely stop to let visitors take in the view of Great Meadow with Dorr Mountain in the background—one of Acadia’s many spectacular views. Hidden to many visitors, though, is the reality of the meadow’s poor health. Thirty years ago Great Meadow was overrun with invasive plants; the septic field at Sieur de Monts leached harmful excess nutrients; decades of manipulations (e.g., soil removal and trail and road construction) altered the natural flow of water (hydrology); and culverts up and downstream of the meadow blocked the movement of fish and other aquatic wildlife. In the 1990s, park crews began aggressively removing purple loosestrife and other invasive plant species, starting the slow process of bringing Great Meadow back to health. Now, with Friends of Acadia’s support, we have expanded our management actions. Last year, we removed the septic system from Sieur de Monts and tied into the town sewer system; we will restore native wetland plants on the former leach field. We are developing plans to replace the culvert at the outlet of Great Meadow, which will improve hydrology and connectivity for wildlife. In five years, we expect to see more native plants and animals, cleaner water, and improved fish passage in and out of the wetland—all of which supports the health and ecological integrity of the watershed. In 2014, the Sieur de Monts spring pool was surrounded by non-native plants—some invasive and some 20 feet tall. They obscured and impaired a cultural landscape closely connected to the creation of Acadia, originally named Sieur de Monts National Monument. As the very first management action of the Wild Acadia initiative, park crews and Friends of Acadia volunteers removed the non-native plants, repaired and reset stonework, and replanted native species to recreate the spring pool landscape that George Dorr constructed more than 100 years ago. Next, we are exploring ways to improve the hydrology of this area—a maze of underground pipes seems to be contributing to flooding around the pool, Nature Center, and Wild Gardens. Already, though, the change in the view and cultural integrity of the site is incredible. Water pollution and obstructions to fish passage in Cromwell Brook threaten the health of the stream’s diverse assemblage of fish and the health of shellfish beds near the stream’s outlet. Shellfish beds between Bar Harbor and Thrumcap Island—including Cromwell Cove—are closed because of pollution, although the sources of pollution are not yet known. To address these challenges, we assembled a team from College of the Atlantic, the University of Maine, and the US Geological Survey to test water quality and flow, help us find pollution sources, and plan fixes to culverts and other obstacles to fish passage. We are working with the Town of Bar Harbor to implement the fixes. This past year the town replaced the bridge where the brook passes under Cromwell Harbor Road; we worked together to ensure that the new bridge would provide adequate wildlife passage. We are now working on plans to replace culverts along the brook and find and mitigate sources of pollution to continue to make life better for the stream’s fish and other aquatic wildlife. There is much more work to be done. But the health and ecological and cultural integrity of the watershed are already markedly improving. Recognizing that work in the Cromwell Brook Watershed will continue as we replace culverts and address more problems, we are now preparing to apply what we’ve learned to another Acadia watershed. The Marshall Brook Watershed starts on the south slopes of Mansell Mountain and drains developed lands in Southwest Harbor before passing back into the park and Bass Harbor Marsh, under Tremont Road at Tremont Consolidated School, and out to sea via Bass Harbor. This summer, we will begin mapping and prioritizing concerns in the watershed. The Wild Acadia initiative will help us to protect Acadia’s health in a time of complex, uncertain, and continuous change. We are excited that this approach is now policy for the whole of the National Park Service. ABE MILLER-RUSHING is the Science Coordinator for Acadia National Park. BRIAN HENKEL coordinates the Wild Acadia initiative as an employee of the Maine Natural History Observatory with funding from Friends of Acadia. REBECCA COLE-WILL is the Chief of Resource Management for Acadia National Park. 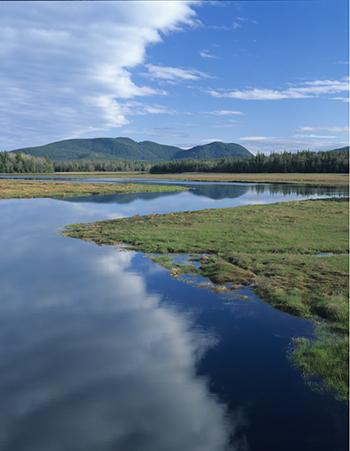 Photo: This peaceful view of Bass Harbor Marsh belies the environmental challenges caused by bridges and other development throughout the Marshall Brook Watershed. Photo by Tom Blagden. I expect that some (all?) of the pollution is due to bacteria levels exceeding the safe level. If that is correct, it might be worth determining the source of the bacteria through ribotyping if that has not already been tried. See info below. ……Researchers found that a bacterial source tracking tool called Ribotyping is an effective and innovative way to identify the actual sources of bacterial pollution present in surface waters. Instead of just knowing how much bacteria is in the water, this technology can tell us if the bacteria came from a specific species such as a dog, cow, or human. The US Environmental Protection Agency and the NH Department of Environmental Services supported the start up costs of establishing a Ribotyping laboratory at the UNH Jackson Estuarine Laboratory located on the shore of the Great Bay Estuary. More recently, UNH purchased a RiboPrinter that allows for automated processing for Ribotyping analysis. This greatly increases the consistency and accuracy of the results. Thanks! We’ll forward this info to the appropriate staff at the park.